This is the first ever major museum exhibition devoted to the work of Ernest Hemingway (1899–1961), one of the most celebrated American authors of the 20th century. Organized in partnership with the John F. Kennedy Presidential Library and Museum, it includes multiple drafts of Hemingway's earliest short stories, notebooks, heavily revised manuscripts and typescripts of his major novels—The Sun Also Rises, A Farewell to Arms, and For Whom the Bell Tolls. The show also presents correspondence between Hemingway and his legendary circle of expatriate writers in 1920s Paris, including Gertrude Stein, F. Scott Fitzgerald, and Sylvia Beach. Focusing on the inter-war years, the exhibition explores the most consistently creative phase of Hemingway's career and includes inscribed copies of his books, a rarely-seen 1929 oil portrait, photographs, and personal items. This exhibition is organized by the Morgan Library & Museum in collaboration with the Ernest Hemingway Collection at the John F. Kennedy Presidential Library and Museum. Lead funding for this exhibition is provided by Karen H. Bechtel, with additional generous support from Tina Santi Flaherty and the Charles E. Pierce, Jr. Fund for Exhibitions. 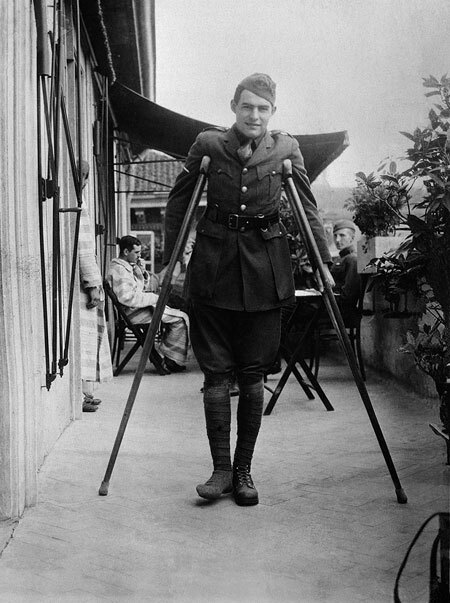 Ernest Hemingway, Milan, 1918. Ernest Hemingway Photograph Collection. John F. Kennedy Presidential Library and Museum.